Harchelroad FP, Jr., Rottinghaus DM. Harchelroad F.P., Jr., Rottinghaus D.M. Harchelroad, Fred P., Jr., and David M. Rottinghaus.Chapter 211. Chemical Burns. In: Tintinalli JE, Stapczynski J, Ma O, Cline DM, Cydulka RK, Meckler GD, T. Tintinalli J.E., Stapczynski J, Ma O, Cline D.M., Cydulka R.K., Meckler G.D., T Eds. Judith E. Tintinalli, et al.eds. Tintinalli's Emergency Medicine: A Comprehensive Study Guide, 7e New York, NY: McGraw-Hill; 2011. http://accessmedicine.mhmedical.com/content.aspx?bookid=348&sectionid=40381693. Accessed April 21, 2019. Harchelroad FP, Jr., Rottinghaus DM. Harchelroad F.P., Jr., Rottinghaus D.M. Harchelroad, Fred P., Jr., and David M. Rottinghaus.. "Chapter 211. Chemical Burns." Tintinalli's Emergency Medicine: A Comprehensive Study Guide, 7e Tintinalli JE, Stapczynski J, Ma O, Cline DM, Cydulka RK, Meckler GD, T. Tintinalli J.E., Stapczynski J, Ma O, Cline D.M., Cydulka R.K., Meckler G.D., T Eds. Judith E. Tintinalli, et al. New York, NY: McGraw-Hill, 2011, http://accessmedicine.mhmedical.com/content.aspx?bookid=348&sectionid=40381693. More than 25,000 products are capable of producing chemical burns. Exposures occur both occupationally and during use of chemicals for activities in daily life. It is estimated that chemical burns account for 5% to 10% of all U.S. burn center admissions. Nonoccupational exposures may number up to 100,000 per year, the vast majority being minor. Deaths are rare (<1% of exposures) and usually result from caustic ingestion. In 2008, there were 5620 reported nonfatal chemical exposures in private industry causing days missed from work, representing about 0.6% of all injuries. There were 130 deaths from exposure to chemicals and chemical products reported in private industry in 2008; 4 from acids and 3 from alkalies.1 See http://www.bls.gov/iif/oshwc/osh/case/ostb2200.pdf. Common household chemical burns are caused by lye (drain cleaners), paint removers (halogenated hydrocarbons), phenols (deodorizers, sanitizers, disinfectants), sodium hypochlorite (disinfectants, bleaches), methacrylic acid (artificial nail products), and sulfuric acid (toilet bowl cleaners). In industries, chemicals are used for cleaning, tanning, curing, extracting, preserving, soldering, and other functions. The most commonly used industrial acids are tungstic, picric, sulfosalicylic, tannic, formic, sulfuric, acetic, cresylic, trichloroacetic, chromic, hydrochloric, and hydrofluoric. Widely used alkalis are the hydroxide salts of sodium, potassium, ammonium, lithium, barium, and calcium. White phosphorus used in munitions was the most common cause of chemical burns to military personnel during times of armed conflict in the 1960s, and was reported to be used as an incendiary in Fallujah, Iraq, in 2004 and 2005. White phosphorus also may be found in rodenticides, pesticides, and fireworks. The body sites most often burned by chemicals are the face, eyes, and extremities. In general, chemical burns are smaller than thermal burns and the mortality rate is lower. However, wound healing and duration of hospital stay are longer. Disability and time away from work tend to be greater than that of other occupational injuries. 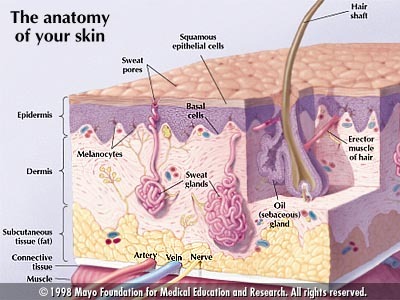 The skin is a barrier and transition zone between the internal and external environments. Although the outer stratum corneum layer of the skin functions as an excellent barrier against many chemicals, some penetrate it readily. Chemicals can produce burns, dermatitis, allergic reaction, thermal injury, or systemic toxicity. Pathophysiologically, burns produced by all chemicals are similar because the skin has a limited variety of toxic responses.2 Toxic reactions are described mainly on the basis of morphologic rather than functional responses.3 Skin has protective mechanisms and elements, including the epidermal barrier, eccrine sweating, phagocytic cells, metabolic detoxification, immunologic processes, and melanin pigmentation (Figure 211-0.1) However, these protective mechanisms vary according to phenotype and may be affected by systemic or local disease.